Google has suggested it may consider setting up an online book store. Google CEO Eric Schmidt told reporters at the Consumer Electronics Show in Las Vegas that this would depend on permission from copyright holders. The web giant has been electronically scanning thousands of volumes and has put some online. But its plans to create an index to all the world's books have run into opposition from publishers and authors. Google has gradually been expanding its empire beyond its origins in search. 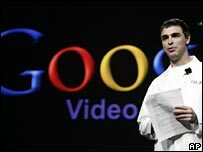 Last week Google launched an online video store during a keynote speech by its co-founder Larry Page at CES. The venture is the first time Google has enabled its users to pay for premium content. While commercial video downloads are relatively new, e-books have been available for years, though they have failed to take off. Sony is also trying to invigorate demand for e-books. At CES, it launched a new portable device to read e-books and announced deals with major publishers to sell them online. Asked if Google would consider doing something similar, Google CEO Eric Schmidt said: "Subject to permission from the copyright holder, yes. I want to be clear on that." 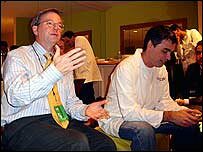 During a briefing with international journalists at CES, Mr Schmidt and Mr Page sought to reassure concerns about Google's book digitisation project. "Google book search is about building the world's largest card catalogue," said Mr Schmidt. "We are not taking copyrighted information". Google is working with Harvard University, Stanford University, the University of Michigan, the New York Public Library and Oxford University on the digitisation project. But the plan has run into legal challenges that temporarily halted the systematic scanning operation. "You are certainly seeing a bit of negotiation by public relations," said Mr Page. "We are not letting you read the book from the library until we have rights from the publishers, which they will give us as it will help them sell more copies." As well as concerns from groups representing publishers and authors, Google faces competition from a similar rival plan to scan books by the Open Content Alliance. The group counts Microsoft, Yahoo and the Internet Archive among its backers.